Hey there! So kind of you to stop by the blog again! Remember when I said I'd get back to blogging? Well I mean it this time! The blog world is so pretty at Christmastime, as is my Instagram feed. 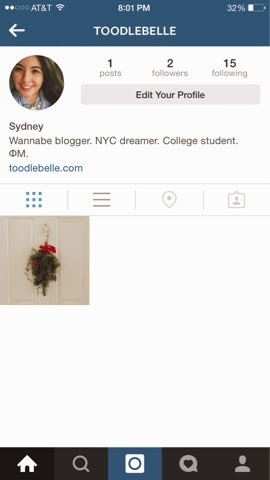 I created a Toodlebelle Instagram account a while back ago, but finally decided to link it to the blog and start posting to it today (I think my friends were starting to get tired of pictures of my coffee and other blogger-style shenanigans)! If you'd like to follow along, I'm begging, please, you can follow through this link! or by clicking the cute yellow button up in the top right corner! Yes, it's a little empty right now, but I'm sure it won't be for long! I followed you! My username is missmichaelaaa! Giving away up to $50 dollars of monogrammed jewelry on the blog today! Don't forget to enter!